More than two years ago, I chose Zoho Mail as my free email provider, and I’ve been very happy with them ever since. In light of the recent PRISM scandal, a few people using free email from providers named in that debacle have asked me how I liked Zoho. Update: I wrote this article in 2011, and had been using Zoho for two years. At some point in 2016, I could no longer use “list emails from this sender” and various other search filters to find messages. I wasn’t the only one. They fixed it over and over, but it kept coming back for me and for a lot of other users in the forums. Also, their spam control has gotten much worse over the years. I finally realized that email privacy isn’t possible unless you only email to other people using a service with good privacy. Send an email to someone on Gmail, and Google’s going to read your email. So I gave up on thinking of email as a thing that can ever truly be private, and I switched back to Gmail. I still recommend Zoho. Not every account has the search filter glitch, and there are other ways to filter the spam. I’m just being up front about the fact that I reluctantly stopped using it. The blurred-out bits are my user name, the names of people I have mail from, and the subjects of the mails. But here’s what you’re looking at. 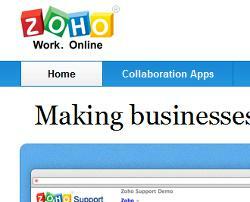 First, on the far left, a cool sidebar showing all Zoho’s other services so you can access them easily. This is awesome if you use Zoho’s other services. Right at your fingertips, you have the Calendar, Tasks, Notes and Links, plus the Notebook, Docs and Spreadsheet apps, and more. This feature totally blew me away. I subscribe to a newsletter from this dude, and he also sends me offers for free downloads and stuff that I always delete without reading. Well, suddenly the offers started going straight to my spam folder, and only his newsletter appears in my inbox anymore. How sweet is that? 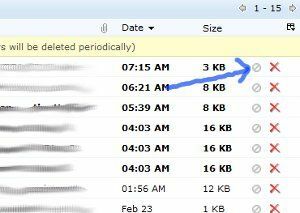 Zoho can distinguish between good stuff and spam coming from the same sender. Now, that’s amazing. You can also manually block certain senders and report spam by just clicking this button here, the one with the arrow pointing to it. Zoho catches most spam with very few false positives – and the few false positives I’ve had were nothing important, just things like newsletters I had actually signed up for. You can set up your domain email addresses at Zoho and have everything come to your account there. Then you can reply, and the recipient will only see your domain address. So you can use Zoho for all your business without anyone knowing you’re doing that. Archiving. Zoho gives you unlimited space for archiving. Chat. Zoho has a chat feature. Folders and labels. You get them both, and you can set up filters to automate how they’re applied to incoming emails. Email forwarding and IMAP/Pop3 access. You can forward your Zoho emails to another address or access emails from another address via IMAP or POP3. This is separate from just setting up aliases as discussed above. Keyboard shortcuts. Zoho has an extensive number of keyboard shortcuts built in – you just need to enable them under settings (this is to keep them from being irritating if you use those keys as shortcuts for something else). Zoho also has a mobile site (rather than an app) that works like a charm. It’s fast, it’s intuitive, it’s pretty and it works. For me, at least, it has all the features I need to comfortably process emails while waiting for an appointment or sitting at a lunch counter. You can also access other Zoho services on the mobile site. Hey, I just wanted to sign up there because it looked nice and I’m also growing tired of my gmail. But I am already stuck at the beginning – zoho asks me to enter a domain name. I chose the free version of course and I’m fine with @zoho, why does it keep bugging me with the domain-thing? I just signed up for a zoho account today. I got a paid account because I have several email accounts/domains. I feel really good about this. I felt the need to diversify my product usage online and I’m so glad I found an alternative to gmail, gdocs. I hated always having to be logged into google. I think they wanted to make it easier, but it actually irritated the heck out of me. Maybe because I have several accounts and I found myself logging in and out constantly. I’m really excited about trying out their screen sharing option. AND, Ya know what. I don’t begrudge paying AT ALL. Funny. 2 years ago I balked at that notion. BUT, there’s tech support at Zoho. Like seriously – wow!!!! I just wish they had funner themes. I love the themes at AOL actually but they were more expensive and didn’t have nearly the same tools. I couldn’t justify paying $6 a month for their themes. LOL. Hi I’m trying to figure out where to enable the “click as spam” in zoho mail, to click and mark one mail or sender as spam. For me it should be right in front of the size of each mail. No, you’re not – they got rid of it for some reason. You have to click the checkbox at the left of the mail, and then use the “Mark as” drop down menu on top, and select “Spam.” A lot of us complained about this, but they refused to put the spam button back (it used to be right where you say it should). Still, that’s the only complaint I have with Zoho, and it’s pretty minor IMO. Their spam filtering is good enough that I don’t get a lot of it anyway. They offer many useful free and low priced apps to add on to their Mail Suite in an easy-to-access side bar. Their CRM is fantastic. Loving their Recruit application. Invoicing is simple and intuitive. They have a cloud office suite that integrates with MS Office beautifully. Most of the apps integrate with each other and our websites. So many useful tools, I’m sure I’m not even using them to their fullest yet. Bonus: Their customer service and tech support is reachable, responsive and reliable. One more bonus of zoho is that accounts are never automatically deleted in Zoho (example 90 days or 9 month ) free or payd accounts. You must explicitly close account. Spam can be a problem though with Zoho. I had to sign up for a separate ( spam filter. Tahnkfully that works well with Zoho. It has gotten worse in recent years. I actually need to update this post – thanks for making me think of it.